A small bird (L 12 cm) with white eye-stripe and bluish plumage. The optimal habitat of the species consists of tops of Corsican pines (Pinus nigra laricio), located between 1,000 and 1,500 m, with abundant dead and rotting trunks for nest-sites. Suboptimal habitats include forests wher Corsican pine is associated with cluster pine (P. pinaster). Food during the winter is probably mainly pine seeds, and in the breeding season insects. Resident. 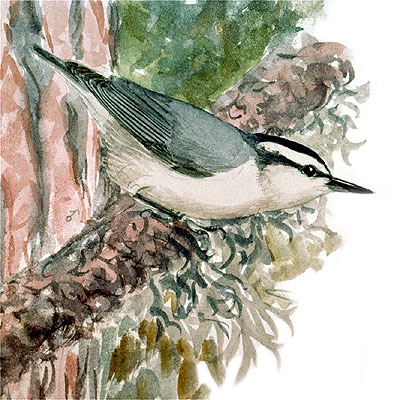 The Corsican Nuthatch is endemic to the island of Corsica. The very limited range and population size (3,000 breeding pairs) of the species make it highly vulnerable. The intensively management of forests and fires are considered to be the major threats nowadays.